The fantasy novel you’ve always wished Jane Austen had written, Shades of Milk and Honey is exactly what we could expect from Austen if she had been a fantasy writer: Pride and Prejudice meets Jonathan Strange & Mr. Norrell. It is an intimate portrait of a woman, Jane, and her quest for love in a world where the manipulation of glamour is considered an essential skill for a lady of quality. Jane and her sister Melody vie for the attentions of eligible men, and while Jane’s skill with glamour is remarkable, it is her sister who is fair of face. When Jane realizes that one of Melody’s suitors is set on taking advantage of her sister for the sake of her dowry, she pushes her skills to the limit of what her body can withstand in order to set things right—and, in the process, accidentally wanders into a love story of her own. Jane does not believe she will ever attract the attentions of a husband, no matter how her mother might scheme, or the dowry her father has put away. She might be talented in the art of glamour, but she is no beauty like her sister. Despite her long nose, however, she is in training to be a heroine, and something must and will happen to throw a hero in her way. As the blurb suggests, Shades of Milk and Honey is, at its heart, Jane Austen plus magic. Being an Austen fan (aren't we all? ), I tend to avoid novels that riff too closely off our Queen of Romance, as, almost always, they aggravate me terribly. I couldn't resist trying Shades of Milk and Honey, however, after being swept away by a number of Mary Robinette Kowal's speculative fiction short stories (You can find a number of these free online at the author's website - while her short fiction focuses on fantasy and science fiction, rather than romance, they are really some incredible reads). The allusions to Jane Austen are overt and frequent, but, thankfully, more fun than ruinous. I ended up quite enjoying the little references to aspects of some of my favorite books and couldn't help smiling at elements of characters that reflected my old friends. It helps particularly that Mary Robinette Kowal has very skillfully written in such a precise tone and manner to resemble Jane Austen, so her allusions feel well situated and respectful. Much of the story centers around the rivalry of the two sisters, who are both interested in the same man (as well as others - since it is clearly best to keep one's options open!). As the narrative progresses, Jane becomes privy to the secret affairs of both her sister and her friend, which inevitably blow up to cause uproar. All the while, Jane is navigating her own romantic interests in both Mr Dunkirk, who also has her sister's eye, and Mr Vincent, the quietly intriguing glamourist who shuns almost everyone's company. The romance storyline did fall a little flat for me. While Shades of Milk and Honey has the manners and tone of Austen, it doesn't quite achieve the romantic passion. Jane is a little hard to like at times, but I appreciated her being a little less sympathetic than her predecessors. Unfortunately, her standoffishness made it hard to understand her feelings and for almost the entire book she seems much more interested in Mr Dunkirk than Mr Vincent, who is, in every other way, clearly set up from the start as her hero. Ignoring Jane's apparent interest in her destined partner, I personally fell in love with Mr Vincent all the same. He's bad with words and instead attempts to show his devotion to Jane through his art. Oh, sigh. How lovely. I just wish I'd felt Jane reciprocate the feelings Mr Vincent so eloquently, if silently, expressed in his glamours. It's in the world of glamours that Mary Robinette Kowal has really written something special, since this is no simple Jane Austen adaptation. The fantasy world of Shades of Milk and Honey is really wonderful. In this world, people can create 'glamours' - folding light, color and sound to create art, and even to perfect one's looks and the appearances of homes. I loved the way this world feels so natural and is so exquisitely executed, so it easily forms this magical alternate regency universe. It's so unique and so beautiful. It also very cleverly explains characteristics of regency heroines - such as their wont to swoon. The final thing I have to mention about this book is the audiobook edition, narrated by the author. I'm sure I've mentioned before that authors are almost always disappointing when narrating their own stories, but - my goodness! - Mary Robinette Kowal is one talented woman. The narration is flawless and makes the audio edition such a great way to enjoy this magical world. 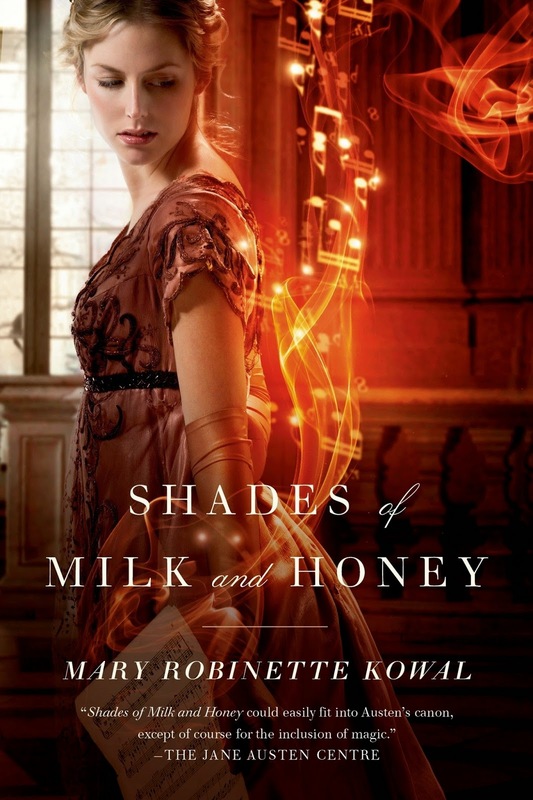 Shades of Milk and Honey by Mary Robinette Kowal was released by Tor Books in 2010.